But if you were to ask the Ann Arbor Pioneer (MI) senior how he feels about that fact, there'd be little complaining. That's because the start of February historically has been pretty good to him. It marked Foster's emergence last season, with three performances over four weeks netting impressive times, including an indoor personal record of 4:12.89 in the mile on Feb. 25. On Sunday, another cycle of improvement begins at the SPIRE Scholastic Showcase in Geneva, Ohio. It's there, on the SPIRE Institute's flat 300 meter track, where the University of Michigan signee is aiming to put together a complete 1600 meter race against some of the Midwest's best talents. "I really haven't had a fast 1600m race this year," said Foster, who ended his outdoor season in 2018 with the fourth fastest mile in the country with a 4:05.50. "It will be a good chance to test myself and there will be some good competition there. The 300 meter track is pretty quick, so hopefully I can get out." The Showcase will be the first of many meets on Foster's calendar before he culminates his indoor season at New Balance Nationals from March 8-10. But sandwiched in between those efforts will be an elite 3200m race at Grand Valley State and Michigan's State Indoor Championships. That busy schedule is one reason why Foster won't lean hard on big expectations for Sunday. "I think at the end of the day, it's about racing," he said. "The splits will come with competing well and if I'm zoned in on the race, then they will take care of themselves." While Foster traditionally has liked to run on the shoulder of pace-setters in fast races, he might have to do the work here. He's the top seed and one of two Nike Cross Nationals qualifiers--Howland (OH) senior Vincent Mauri is also entered. Time will ultimately tell how Foster races, but there's no discounting his feelings for the mile. "For me, I like to just run fast and in the mile I can get out to a pace and just cruise the whole time," he said. 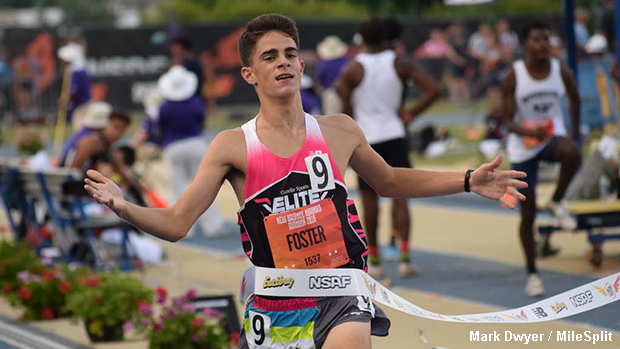 Foster has run one challenging mile this season, a US No. 7 time of 4:13.86 at the Gazelle Sports Elite Meet in early January, though he's coming off a fast 800m on Feb. 2 at Eastern Michigan, where he ran a US No. 4 time of 1:53.73. Because of harsh Michigan weather, Foster has been training indoors on treadmills, where he's worked up to "faster distance runs," though when the when the opportunity arises, he says he's found time to get on the track. "Last week we did 10 x 400s at right around 63-second pace," he said. So Foster's legs should be ready for a big race. But he said recently he's going to concentrate more on the tactics of the race. "My coach is trying to get a feel for racing, so when I get into faster races I'll be be able to react better," he said. "I'll be able to get the race instincts where they need to be." Foster's pedigree certainly should come as no secret, though. 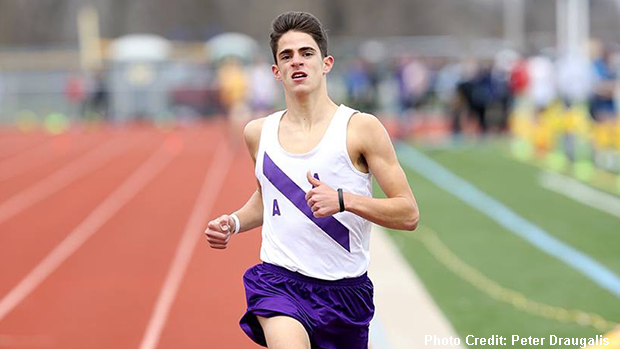 An All-American at Nike Cross Nationals this season in 13th, Foster was a two-time state Division I cross country winner in Michigan and is the returning national champion in the 2-mile from New Balance Nationals Outdoor (8:59.46).